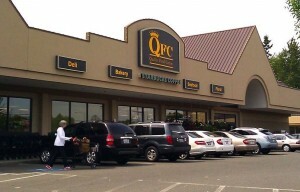 QFC (Quality Food Centers) is a supermarket chain owned by The Kroger Co. The company is based in Bellevue, Washington in the United States. QFC was founded in 1955 in Seattle, Washington by Jack Croco. He started his grocery business in 1940. At that time, he was working as the district manager of Albertson’s supermarkets. In 1956, he opened his own store. The name of the store was Lake Hills Thriftway. The original QFC was founded in 1955 by Vern Fortin and his colleagues. In 1960, Lake Hills Thriftway was sold to QFC . They also changed its name to QFC. In 1986, the company was again sold to a Seattle based firm, Sloan, Adkins & Co for $34 million. During that time, the stores also started selling wide variety of foods and they were open 24/7. Sloan also renovated the existing stores, making them much bigger. By 1986, the annual revenue peaked to $158 million. The company expanded its stores and by 1991, it owned 21 stores. An Asian store named Asian Choice Kitchen was also opened. By 1992, the company had 33 stores in total. In 1994, it also bought Johnny’s Food Centers and Olson’s Food Stores. Due to financial breakdown, the company was sold to Fred Meyer, in 1997. At that time, Christopher A. Sinclair was the CEO of the company. When Fred Meyer merged with The Kroger Co. in 1998, QFC also became a part of it. The company started expanding its stores even before it was sold to Fred Meyer. In 1974, it bought A&P supermarkets in Seattle. In the 1990s, QFC further expanded its stores. It bought many stores like Olson’s Food Stores, Johnny’s Food Centers, Stock Market Grocery Stores and Thriftway Stores. All these stores were renamed as QFC. By 1996, the number of stores peaked to 30. In 1997, the company also bought grocery stores in Port Hadlock and Port Townsend. The company also opened new stores in Portland, Oregon. Later, in the 1990s, QFC also acquired Hughes Family Markets, which retained its name. Ownership: Owned by The Kroger Co.
Geography: Bellevue and Puget Sound in Washington, Portland in Oregon. I wish to commend Travis in the meat department at the Wallingford QFC store in Seattle. He went far beyond my expectations by helping me select the perfect roast for a dinner party. He made excellent recommendations as to the seasoning and preparation of the roast and it turned out to be magnificent. Travis provided outstanding customer service and I wish to see him recognized for being an exemplary QFC employee. My wife and I live in Bremerton and were sadly disappointed to learn today that our QFC on Kitsap will be closing on May 13, 2014. When my wife returned from the store this afternoon she was angry, to say the least. We understand that our economy here in Bremerton has suffered greatly in the past six years and know that you must respond to market factors. Still, we cannot help but believe that a location with low overhead (the store is, by no means, new) could survive tough times even more than a newer store with huge capital expenditures. We think you should capitalize on the advantages you have and continue to operate this store. We are quite fond of the employees there who are normally very glad to see us and make an effort to see that we are satisfied with their service and your selection. We have found that your butcher in the meat department is especially conscientious. Having to find another place to purchase such an important staple will be hard. As we have aged and watched so many changes in the world around us, we grieve for the fact that our culture no longer rewards the development of community. It’s a sad, sad, state of affairs that reflects on the entire nation. While we thank you, and are grateful for your service, we remain disappointed in this news.